This book is a collection of judgments drawn from the innovative Wild Law Judgment Project. In participating in the Wild Law Judgment Project, which was inspired by various feminist judgment projects, contributors have creatively reinterpreted judicial decisions from an Earth-centred point of view by rewriting existing judgments, or creating fictional judgments, as wild law. Authors have confronted the specific challenges of aligning existing Western legal systems with Thomas Berry’s philosophy of Earth jurisprudence through judgment writing and rewriting. This book thus opens up judicial decision-making and the common law to critical scrutiny from a wild law or Earth-centred perspective. 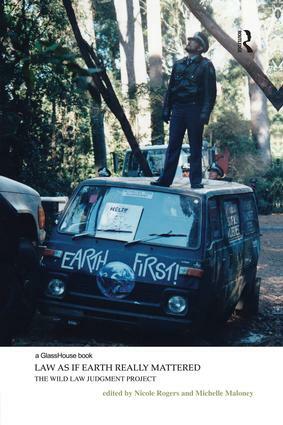 Based upon ecocentric rather than human-centred or anthropocentric principles, Earth jurisprudence poses a unique critical challenge to the dominant anthropocentric or human-centred focus and orientation of the common law. The authors interrogate the anthropocentric and property rights assumptions embedded in existing common law by placing Earth and the greater community of life at the centre of their rewritten and hypothetical judgments. Covering areas as diverse as tort law, intellectual property law, criminal law, environmental law, administrative law, international law, native title law and constitutional law, this unique collection provides a valuable tool for practitioners and students who are interested in learning more about the emerging ecological jurisprudence movement. It helps us to see more clearly what a new system of law might look like: one in which Earth really matters. Nicole Rogers is based in the School of Law and Justice at Southern Cross University, Australia.